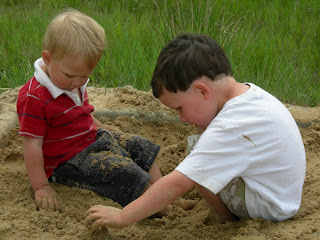 Whenever we decide to go for a walk or go to a park, the kids always ask if we can go to the "sand pit". 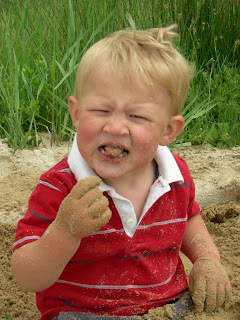 The "sand pit" is a volleyball court close to our house that is mostly used by the little kids in our neighborhood as a sandbox. If it's been a long time since we've been there, I usually say yes. If we have been recently, I always no. It's been awhile and so I said yes. As you can see from the pictures you will see why I should have said no. We had to come home and hose everyone down. Now I'm off to do laundry!! Fun, fun!! 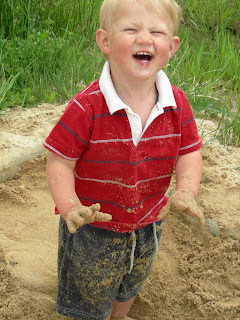 Benjamin is finally "legal" to go to nursery. He happily walked into nursery his first week all by himself and the report was that he didn't cry until being pushed down the slide. He had a nice rug burn to show for the week. He was a little more reluctant to go into nursery his second week and did fine until he somehow got a small gash below his eye. No one who can talk knows how he got the gash, but we are hoping he will continue to be happy to go to nursery and be with his fun nursery leaders. 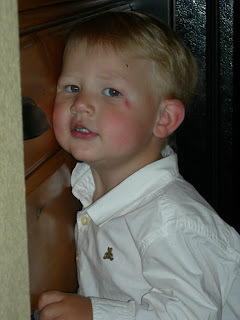 Here is a picture of Benjamin with his nursery wounds. 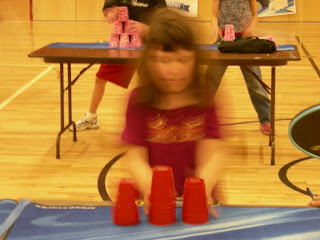 Last Thursday, Sarah and Andrew had their first cup stacking tournament. They went against about 30 kids all from their school. They were given time to warm up and then they competed in three events the 3-3-3, the 3-6-3 and the cycle. They did each event several times and then their best time was recorded. From these times the top five kids then competed in the final tournament. Sarah was in the top five for all three events. Andrew was in the top five for the cycle and missed being in the top five for the other two events by just 2 hundredths of a second. He had just gotten off his cast the day before and was still wearing a brace, so we felt he did really well!! In fact, when Coach Beth awarded Andrew his medal she pointed out to all the parents that Andrew had had his cast on almost the entire session. Sarah took 1st place in the 3-3-3, 3rd place in the 3-6-3 and 2nd place in the cycle. Andrew took 5th place in the cycle. 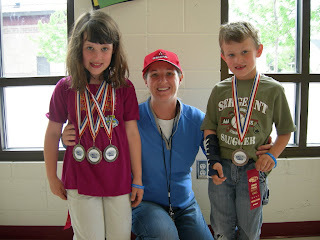 After the tournament, we had an awards ceremony where they got their medals and then a pizza party. They are excited to compete next year against schools from Nampa and Twin Falls. It has been a fun opportunity for them to learn something new and do well at it!! 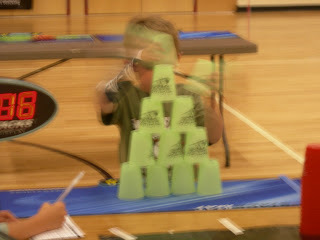 I love these pictures as they show how fast they are going - they are just a blur!!! I've been wanting to start a blog for some time now. 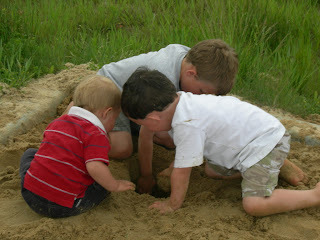 I'm excited to share all the fun things our Four Cute Kids are doing. Happy Reading!! !